If you were taught in school that gravity is a powerful force of nature that cannot be overcome or shielded, that the smallest particles which make up all matter are electrons and protons, and that psychic phenomenon like telepathy and clairvoyance are the domain of fraudulent charlatans with no possible scientific basis, you would be amazed at the many things science has uncovered in recent decades. 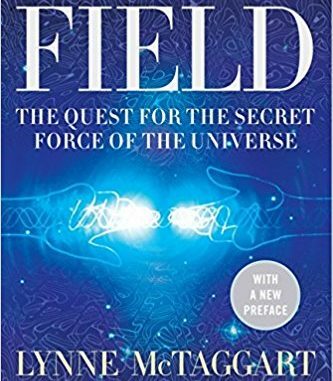 Lynne McTaggart’s book The Field: The Quest for the Secret Force of the Universe will help you see the world in a radically different light. 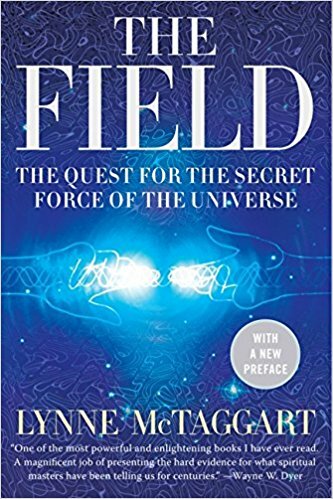 Lynne explores the work of various physicists, biochemists and other scientists who have stumbled across or purposefully searched for evidence in their respective fields that there is a force, which she calls the Field, which connects all beings and matter at a fundamental level. And our involvement with and connection to this Field can explain many things that heretofore have either been unexplainable or considered not possible, including things of a psychic nature. This is all a little confusing, but an analogy that might help is the relationship of a drop of water to the ocean. If you were to take a drop of water and look at it, you could see it in its totality. It is, perhaps, several millimeters wide and tall and largely spherical in shape. It is, in a sense, a discrete item. But if you were to place that drop back into the Atlantic Ocean, where is it? It gets reabsorbed into the larger entity, inseparable from the trillions of other drops that could be discretely pulled out and measured. The drop you were just looking at could just as easily be off the coast of France as it could be off the coast of New Jersey, because it is now part of a single entity that that spans that great distance. So, the particles, which make up the photons and electrons, which in turn make up us and the entire universe, are kind of like those drops in the ocean. They are bits of energy that pop into existence (the “drop”), receded back into the field from which they came (the “ocean”), and then remerge in a never ending cycle. Just as the drop which could, when integrated with the Atlantic Ocean, be at once along the coast of both France and New Jersey, the particles which comprise you and I are also simultaneously a part of the Field which permeates one edge of the universe all the way to the other edge. With an intellectual underpinning of the Field now established, we can begin to understand two primary takeaways from McTaggart’s book and theories regarding the Field. First, there exists a limitless source of free energy available for harnessing, from the Field, if only mankind can learn how to do it. (And, in light of the trillions of dollars that have gone missing by the United States government into the “black budget” over the recent decades, it may not be so farfetched to consider that we have already learned how to do it, or else may soon learn.) Second, if the particles that make up our bodies come into and out of existence from an underlying field that stretches from one end of the universe to the other, and if information or intelligence can also be transmitted through this same field, it can explain a great many things that heretofore have not been explainable. This Field could explain things like ESP, telepathy and “remote viewing.” If we are all integrated with the Field, it would be possible to see or perceive things from around the world and at a great distances because, it is theorized, information can be transmitted through the Field instantaneously. And, since this Field is believed to permeate the Universe, there’s reason to believe information can be transmitted far beyond our own planet. Remote viewers are believed to use the Field in a similar fashion. Remote viewing is a term for a form of psychic activity initially developed in the early 1970s by researchers (initially Hal Puthoff and Russell Targ, working at think-tank SRI International in Stanford, California) working with purported psychics (initially Ingo Swann.) Based on their initial successes in this research, the CIA and U.S. military funded additional research in order to use the skill to conduct espionage on the Soviet Union and other countries in the latter days of the Cold War. (Our country somewhat reluctantly got into this activity because it was believed the Soviets had very talented psychic spies already doing this successfully against us, and our military didn’t want to permit them any advantage.) What is of particular interest here is that Puthoff and Targ used careful scientific protocols in their research, and these protocols ruled out just about all other explanations for how this skill worked except for the presence of some kind of shared, knowledge-transmitting field. Much like Edgar Mitchell testing his clairvoyance skills from outer space, Puthoff and Targ conducted remote viewing sessions from within Faraday cages and in submersible craft under hundreds of feet of sea water, among other places, to filter out possible electromagnetic or other possible means of information transmission. No matter where they tried or what potential fields they filtered out, their remote viewing subjects demonstrated an ability to discern details on their targets. A typical remote viewing session involves at least three persons. One person determines what the “target” is to be viewed or studied. Obviously, this person knows what the target is and could influence, intentionally or unintentionally, anyone else involved in the process. For this reason, the identification of the target would often be given to a second person, usually in the form of a sealed envelope or some other manner that sufficiently masked the target’s identification. And that person, without any knowledge of the target’s identification or location, would initiate and oversee the session in which a third person, the “remote viewer,” would attempt to glean and write down relevant information about the target. In this way, the activity was double-blind, because the person overseeing the remote viewing session and the remote viewer himself had no knowledge of the target to be viewed. In case you’re wondering how a remote viewer is able to come across information on the target, he or she typically places himself in a very relaxed, almost meditative state. The person conducting the session then gives the remove viewer a randomly-generated number which has initially been assigned to the target by the first person (with knowledge of the target.) It is believed that the assignment of the random number to the target by the first person creates a link between the number and the object, and armed with only the random number, the remote viewer is somehow connected with the target. Through his or her “mind’s eye,” the remote viewer is able to begin the process of studying and analyzing that object, remotely. Entire books (and some rather fascinating ones), have been written on the topic of remote viewing. (Two that I recommend are Reading the Enemy’s Mind by Paul H. Smith and Remote Viewers: The Secret History of America’s Psychic Spies by Jim Schnabel.) But, as McTaggart points out in her book and as it is evident in the other books on the topic, something really is there. Psychic spies have successfully uncovered secrets and insights that, over time, have proven to be accurate, and in some cases, astonishingly accurate. And the double-blind nature under which they typically are conducted make the likelihood of an all-encompassing, information-transmitting Field the best possible explanation for how this process works. And, you don’t have to be particularly gifted to remote view. Research has shown that just about everyone can have some level of success remote viewing, not just those possessing a special psychic gift. Changing topics, a bit, it is very possible that chemicals and hormones act in coordination with the Field. For example, French scientist Jacques Benveniste, who was studying “basophil degranulation, or, the reaction of certain white blood cells to allergens” made a small error in his laboratory. He and his staff had diluted with water a sample of allergens much further than they had intended to, and yet they found that the resulting chemical solution had essentially the same results in their test as if they were using a more full-strength variant. They decided to test this further and diluted, and diluted, and diluted their allergen materials to the point where there could hardly have been a single molecule of the original allergen remaining in the diluted water solution. And the basophils they were studying still reacted to the solution as if molecules of the original substance were still present. Benveniste theorized that the original molecules left behind some kind of “energy signature” of itself in the diluted water. Although the allergen was effectively no longer present, its energy signature was, and this energy signature had the same effect on the white blood cells as if allergen molecules were themselves present. Other scientists have replicated Benveniste’s approach, with other drugs and chemicals, and found similar results. If no meaningful presence of the original drug or chemical molecule was needed to have the resulting effect, could that chemical energy signature somehow be captured? Benveniste took his research a step further. He studied the actions of molecules and compounds using computers and recorded their actions onto computer storage media. (Apparently, it wasn’t too terribly sophisticated. All you need is a good quality sound card that comes with all computers these days.) At a later point in time he played back the recordings to other organisms or cells, and they reacted just as if the physical compound had been injected into their surroundings. He mailed recordings of these recorded energy signatures to collaborating scientists through the postal mail, and when they played back these tapes in other laboratories, they found similar results. If chemicals act by transmitting energy signatures through the Field, this can also explain how emotions can flash through a human so quickly. Under conventional biochemical theory, when a person succumbs to emotions like anger or lust, certain chemicals are secreted in the body. These chemicals collide with other cells in the body that have receptors attuned for those chemicals, and as parts of your body increasingly receive these chemical signals, your body increasingly reacts to the emotion initiated by your brain and nervous system. The problem with this theory, according to some of the research cited by McTaggart, is it is cumbersome and time consuming for chemicals to bump into each other and spread the emotion in a mechanical fashion throughout your body. But, what if these chemicals relayed their effects through the Field? This process would happen dramatically quicker if cells didn’t have to collide with others and require luck to find those with the right receptors. It would better explain how complex emotional states can be achieved in such short periods of time. The chemicals and hormones are still important to the process, but perhaps they communicate by transmitting energy signatures, not unlike the blood cell reaction to allergens in the prior example. There’s also a theory that memories are not stored in our brains, but rather in the Field. Biologists who have considered this possibility have theorized that when we wish to access a certain memory, we somehow tune our brain to a particular frequency that accesses the desired memory in the Field. A possible example of this is work done by Karl Lashley in the 1940s. Lashley was trying to advance a theory first developed by Wilder Penfield that the brain stores certain memories in certain locations in the brain. Lashley experimented on rats and would first teach them to chart a course through a maze. Once the rat had learned the successful path, Lashley systematically proceeded to damage and destroy portions of the rat’s brain until it could no longer make its way through the maze. Once the rat “forgot” the path, he would look to see the portion of the brain that he had last destroyed, and figured that that was the location where the rat had stored the path. But no matter how much of a rat’s brain he destroyed, they showed a resilient ability to remember the path. Lashley destroyed enough portions of enough rats’ brains to suggest the distinct possibility that perhaps memories are stored somewhere other than the brain. And a story that I read in another book which discussed the brain is reminiscent of this. Apparently some humans succumb to a brain wasting disease in which their brain matter simply disappears over time. Some extreme cases have found humans with barely a thin layer of brain cells attached to the inside of their skull, and nothing more. And yet, even in these cases, humans have been able to operate as if their brains were still fully intact. If enough of the brain was present to serve its “energy signature” purpose, just like enough of the energy signature was left behind in Benveniste’s heavily diluted allergen solutions, then perhaps we can continue to operate with very little of our actual brain mass present. This theory is especially powerful if you combine the fact that our memories and consciousness may be located outside of the brain, and the brain serves largely as a tuning fork to tap into the desired memories via frequency modulation. Another possible data point for the existence of the Field can be found in the work of a German theoretical biophysicist by the name of Fritz-Albert Popp. In 1970, Popp believed he had found a cure for cancer. He was studying one of the most lethal carcinogens to humans known as benzo[a]pyrene, and was experimenting by shining ultraviolet light against it, using different light frequencies. The chemical had a strange reaction to the ultraviolet light. It would absorb the light but retransmit it at a different frequency. Popp illuminated this same light on a very similar compound, called benzo[e]pyrene, which had one difference in its chemical make-up that made it non-carcinogenic to humans. In that instance, the same light frequency passed through the non-cancerous chemical unaffected. Popp expanded his trials to 37 other chemicals, some cancerous and some not, using various frequencies, and in every case he found that cancer-causing chemicals absorbed a specific light frequency (at 380 nanometers) and retransmitted it on a different frequency. Popp’s theory worked perfectly, and cancer experts agreed it was plausible, except for the fact that no scientist or cancer expert believed the human body emanated light internally. Popp continued his research undeterred and eventually convinced a graduate student, as part of his PhD dissertation, to prove that light did NOT exist within the human body. That student built the first-of-its-kind and highly-sensitive machine, similar to an X-ray machine, which detected light, photon by photon. In 1976 this machine detected photons being emitted from cucumber seedlings. Suspecting that chlorophyll, present in all green plants due to photosynthesis, was responsible for this, he next tried the machine on potatoes that were grown in the dark. Not only did those potatoes produce light photons, but they were even higher in intensity than the cucumber seedlings. If cucumbers and potatoes emit light photons, it is entirely plausible that humans do also. And if this were true, Popp’s revolutionary theory that cancer can be caused or cured by wavelengths of specific frequencies was largely proven. Although it was not discussed in McTaggart’s book, Popp’s work is reminiscent to that of an inventor named Royal Rife. Rife allegedly created a powerful microscope. He would stare at cells while at the same time broadcasting different frequencies of energy at them. He found that certain cells, like cancer cells, could be destroyed by specific wavelength frequencies. And, apparently, cancer could also be created by specific wavelengths, too. As modern legend has it, all of Rife’s microscopes were confiscated or have gone missing since his day, relegating his work to the realms of conspiracy theories and folklore. But, if there’s truth to these stories, and it seems very reasonable if you believe Popp’s research, here is further evidence we live in an interesting world driven more so by vibrational energy than mass. And by extension, the possibility that the Field connects us all. McTaggart describes even more examples of scientists working on projects that imply a Field is at work. Very briefly, these include physicist Hal Puthoff who believes there may be a “zero point field” from which we could pull vast amounts of limitless energy. This “free energy” would make our oil and gas infrastructure obsolete overnight. Puthoff also explored new theories related to gravity and believes the zero point field could be used to alter the effects of gravity such that interstellar transportation could be possible for the human race. And finally there’s the work of Elizabeth Targ at the California Pacific Medical Center’s Complementary Research Institute who did research on healing during some of the worst periods of the AIDS epidemic. In double-blind studies, groups of healers from different faiths and persuasions were asked to remotely heal patients with AIDS by concentrating on the patients and sending their healing energies remotely. There was a control group of patients with AIDS in similar states of development. The two groups were as identical as possible, including taking the same anti-viral medications; and no patient knew if he was in the healing group or the control group. The patients to whom healing energies were being sent performed much better than the control group. Their health was measurably better, they required fewer drugs than the control group, their blood counts were better and they were hospitalized with significant health issues markedly less than the control group. If there is a Field through which information and energy could be transmitted instantaneously, it could explain how these healers were able to effect the outcomes of the patients that they never met. Reviewer’s Conclusion: I would like to think that the Field is real and exists. It would explain so many things. It would explain how two trees growing next to each other will direct the growth of their new shoots and branches away from each other. Their branches don’t collide with each other, but you can plainly see based on how they are growing that they sense each other. Perhaps, by tapping into the Field, these plants sense the other’s presence nearby and they proactively choose not to compete for the same space and sunlight. It could explain how flocks of birds and schools of fish can fly/swim with such syncopated precision, turning and diving and darting so quickly that it is otherwise hard to understand how they can all operate together with such cohesion in the absence of some kind of non-verbal communication. Perhaps they’re in a state of coherence with each other and instantaneously communicating with each other at a fundamental level made possible by the Field. There’s reason to have hope for a better future if the Field is real, and we learn how to tap it. If we can harness free energy from the Zero Point Field, the abundance of free and clean energy would mean a dramatic improvement in the standard of living for all humans on the plant. It would also mean humans could achieve interstellar capabilities and reach beyond our solar system. The work of Fritz Popp and Royal Rife also imply that diseases could be eradicated simply by learning what energy frequency a disease reacts to and beaming that energy wavelength into the effected cells. Knowledge of the Field can also help the human species imagine a better tomorrow. If we can manifest results in our surroundings by concentrating and imagining them into existence, through “intent,” we can work together as a species to imagine a world with less crime, less disease and less conflict. Christian tenets to “do onto others as you wish them to do onto you,” and Buddhist beliefs that we are all one and a part of the whole, take on a whole new meaning when you can match them up with potential science like the Field to explain how science and faith might converge here. Likewise, prayer may no longer be viewed as simply as wish conveyed to God, but an intention that can actually have material impact through our ability to envision something into existence. But, as fascinating as these theories are, I wouldn’t be surprised in the least if a large percentage of people reading this remain skeptical. After all, when people tried hard to change the results of the random number generating machine, they failed to have an impact more than 49% of the time. When Edgar Mitchell tried to convey his thoughts back to Earth, he didn’t have the opportunity to do so on two nights of the mission. Nevertheless, someone was undoubtedly scribbling down symbols on those two nights unaware that Edgar was too busy to do his part. And despite this, the participants of the test considered the exercise a success because symbols were matched up a rate greater than statistical probably would suggest. And, one of my favorite subjects is remote viewing, and I happen to know that there are a great many failures and misses mixed in with the legendary and memorable successes. Perhaps as we continue to theorize the existence of the Field and interact with it more, we will be more successful. Perhaps we’re like students trying to learn a new language, and with persistence and effort we’ll get better at harnessing the Field. Until then, I’ll hope that it is the good guys who succeed and use this new science for good rather than evil. And I look forward to the day we can cure headaches and cancer with tape recordings of energy wavelengths rather than drugs and chemotherapy.